Web-based, centralized backup monitoring and reporting for multiple installations of NovaBACKUP licenses. NovaBACKUP Version 19 includes 4x faster restores due to new technology that builds an index into your backups for the fastest backup import speeds ever. 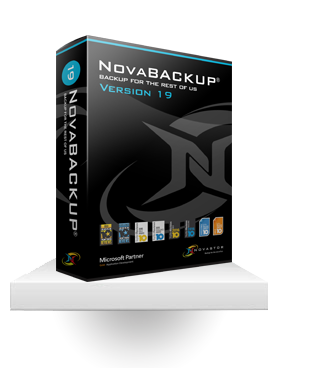 NovaBACKUP also utilizes new technology to backup files in parallel without compromising data integrity. This release also includes support for the new Windows 10 Creator updated and more. NovaStor offers the best backup software available online. Data backup is extremely important to the success of your organization. Your files and documents are important and need the highest level of protection. Each of our products is sold as all inclusive with simple pricing. That means no hidden fees for add-ons and additional plugins. With exceptionally fast and secure backup solutions and unbeatable professional support, NovaStor is the best provider of backup software you’ll find online. Computer backup and server backup have never been this simple and dependable! NovaStor products support a multitude of backup destinations, so you can back up your files your way. Back up your data to external hard drives, local media devices, or network attached storage. Our products also support online data backup. We’ll even provide you with 2 GB of free cloud storage to get you going. With NovaStor data backup products, you’re getting the best online backup service because you can manage local and cloud backups using one user-friendly interface. You’ll won’t find better data backup software anywhere online. Computer backup and server backup just got a whole lot easier. Keep using the file-sharing services you know and love. With NovaStor products, you can protect your most important data by backing it up to your preferred cloud platforms. Take advantage of seamless integration with file-sharing services such as DropBox, OneDrive, GoogleDrive, iDriveSync, and SafeSync. Using online backup services from NovaStor helps you keep your crucial files and data secure. It’s one less thing you need to worry about! All NovaStor products also support both full and incremental backups. When you schedule incremental and differential backups between your full backups, you can be sure that your data is safe without having to constantly run full backups. Image-based backups ensure the data on your PC, Windows Server, or SQL Server can be recovered in the event of a hard drive failure or other disaster. With Disaster Recovery, you’ll always have an exact copy of your entire system. If you’re looking for the best online backup service for your organization, you’re in luck: You just found it. Our products have consistently tested faster than the competitors. There are no other online backup services like the ones offered by NovaStor. It’s backup for the rest of us. Call, email or live chat. We've got your back.